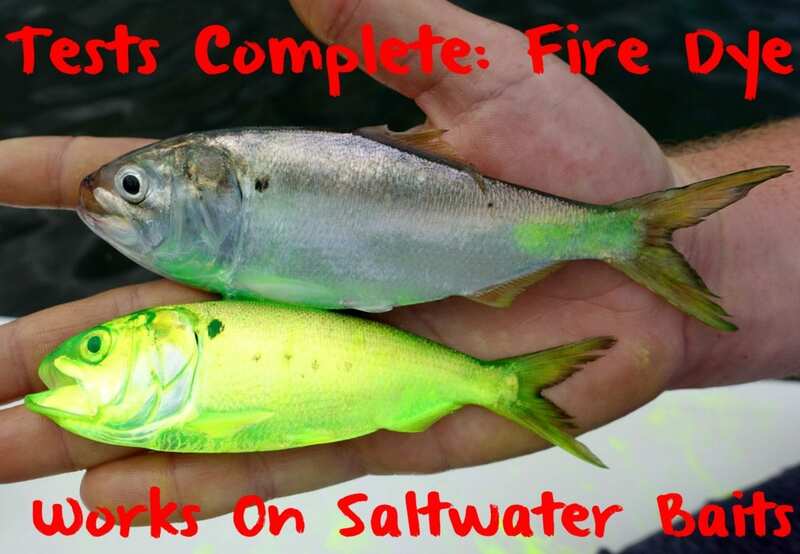 For more than a year anglers have asked if Fire Dye works on live saltwater baits. Unfortunately, we hadn’t been able to answer that question. Our lab and field-testing has been preformed on freshwater species. Meanwhile, on a recent trip to North Carolina to film episodes of Pautzke Outdoors for catfish on Gaston Lake and crappie on Falls Lake we built in time to drive to the Carolina Coast and experiment in the salt. To add credibility Kyle Deavers of Big Boy Fishing and I hopped aboard with well-known, respectable and veteran guide Rennie Clark. Why did we choose Clark? Simple. He isn’t a bait guy. He doesn’t fish bait often and prefers artificials. We booked a trip like a normal customer and asked Clark if we could test our baits. Full disclaimer: Pautzke and Clark have no relationship. We didn’t get a free trip. We paid his normal rate. If we could convince a non-bait guy that our live Fire Dye baits were effective we’d have something exciting and new to share with the saltwater world. We started with mud minnows, which are sold in most tackle shops on a fair portion of the East Coast. These are baits you don’t need a boat and cast net to attain. Fortunately, following the directions for the short soak the Fire Dye took to them within 30 minutes and didn’t hurt the bait. They swam with as much energy after being exposed to the dye as when we purchased them. We always wanted to try the dye on live shrimp. After removing the mud minnows from the Chartreuse Fire Dye we dumped a dozen shrimp in. It took about 45 minutes, but they took the dye as well. It didn’t wash off either, which you’ll see in the next episode of Pautzke Outdoors. At this point it was time to try the dye on species we couldn’t purchase from tackle shops. Clark threw his cast net and caught a few dozen mullet, pogies (which are called many other things up and down the East Coast) and a few pinfish. These baits took the dye the quickest and looked incredible. With the water being off-color from recent storms and high winds the chartreuse baits stood out well. Everything we tested took the Fire Dye quicker than the freshwater live baits did. Clark told us not to expect much in regards to action. Storms, high winds and murky water had kept the bite in check. Meanwhile, with the live Chartreuse Fire Dye baits we caught more than a dozen redfish, plenty of flounder and a few sea trout. These live baits out-fished Clark’s lures, too. He was more than impressed and so were we. It gave us the green light to film more episodes on the East Coast and the Gulf in the coming months. Editor’s Note: Pautzke Fire Dye is available online from dozens of retailers. If you ask for it any local tackle shop can purchase it from their distributor as well. Clark operates Tournament Trail Guide Service out of Wilmington. For more information on his inshore trips please visit https://www.facebook.com/TournamentTrailCharters.